Sue Pyle, of Strongsville, Ohio checked out some of the many items she donated to Save & Serve Thrift Shop for its Christmas Open House. Sue Pyle wanted to downsize from her home in Strongsville, Ohio to a smaller place. That meant doing away with some of her most valuable treasures, her many Christmas tree displays. For the past 26 years, Pyle has filled her house with the trees, each with its own separate theme. Year after year, she opened her house to many an admirer. Pyle’s trees came in all sizes. She decorated as many as 32 trees. Some were half-trees that hung on the wall while others were miniature trees. Of course, she had a traditional Christmas tree, too. The trees and ornaments took up a lot of storage space when not used. Though she hated to do it, Pyle knew in downsizing she had to dispense of much of her holiday decorating tradition. Friends encouraged her to sell the decorations, some of which she had had for years. Others told her to hold a garage sale. But neither is what Pyle had in mind. 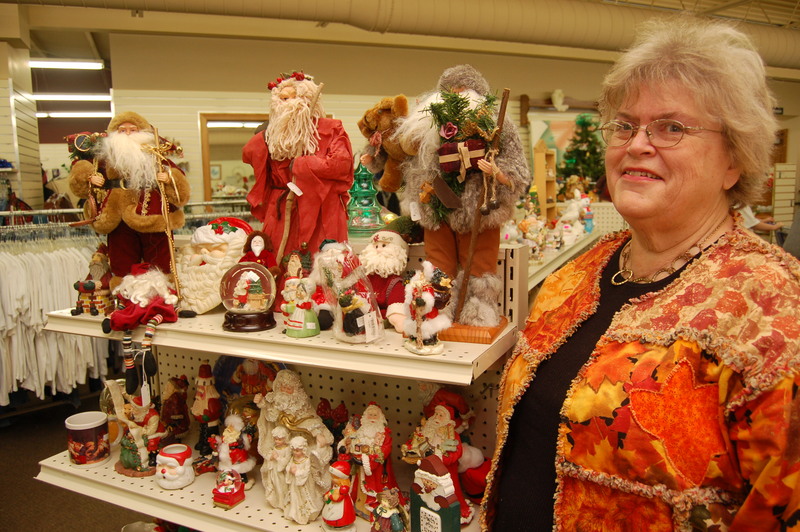 Instead, Pyle remembered what some friends had told her about the annual Christmas Open House held at Save & Serve Thrift Shop in Millersburg, Ohio. She had visited the store, learned of its mission, where the profits went, and made up her mind to donate her Christmas collection to Save & Serve, even though it was an hour away from her home. In total, all of Pyle’s seasonal decorations filled a 16-foot box truck and a van. It was probably the largest seasonally specific donation of it’s kind, according to Eric Raber, co-manager at Save & Serve. In addition to her Christmas items, Pyle also donated fall and other holiday decorations. Raber said the donations from Pyle helped make the Christmas Open House a huge success. The event was held Oct. 25-27. “We sold 2,000 items the first day alone,” Raber said. Curious as to how things would be displayed, Pyle visited Save & Serve the first day of the Christmas Open House sale. Raber praised the seven volunteers who spent many hours organizing and creating the festive Christmas arrangements. He said many of the items were from Pyle’s donations. Raber said this was the third year for the Christmas Open House, and the most successful. He said sales from the first day of the open house were the best since the opening day at Save & Serve’s South Washington Street location. Raber said Save & Serve appreciates the generosity of all those who donate merchandise, as well as the generosity of time by the many volunteers who sort through the donations. Pyle, a retired elementary teacher, said she started her collections from the gifts given to her by students. Some of her themes included a hunt tree, a kitchen tree, little books and a bear tree. She even had a Lakeside, Ohio tree, a place where she vacations annually. Pyle’s generosity wasn’t just aimed at Save & Serve. In 2001, Pyle began creating a themed tree that she donated to the Akron Children’s Hospital’s Holiday Tree Festival. The trees are purchased with the proceeds going to the hospital. “This year I am doing a Merry Mickey Christmas tree,” Pyle said. Like the many shoppers at Save & Serve, whoever buys that tree will have their holidays enhanced thanks to Sue Pyle. Great article…so proud of all my friends for the giving and sharing.